This truly adventurous endeavor of Public Eyesore sends Ben Bennet and Jack Wright into a spiral of spontaneous combustions via sound and human energy up to the point where music is being explored without any linear string of melody or even coherency. The result is magic through the complete freedom in space and time that Bennett and Wright fly their sounds through. The collaboration itself combines unsettling percussion and drums with different saxophones, giving birth to a wild beast that can be recognized through the crystalline oddity that mix sounds of bodily fluids and agonized wind instruments. 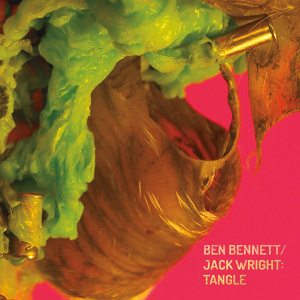 Bennet and Wright’s “Tangle” is as free, wild, carnal and challenging as can be imagined. Their slightly humorous approach makes the total creation even more interesting and admirable. Beware, though, as the freest things are the most challenging and wild, but it’s a price you’re willing to pay in order to witness such uncaring, unyielding and untouchable beauty.